The Austrian conductor Bernhard Steiner received his musical education at the University of Music and Performing Arts Vienna. After his studies he conducted more than 200 concerts of the world famous Vienna Boys’ Choir in many European countries, the USA and Canada. He also rehearsed for the Salzburg Festival, the Wiener Festwochen and broadcasts of the Austrian Television (ORF). After winning the Conducting Competition of the Vienna Chamber Orchestra in 1991, Bernhard Steiner appeared regularly with the Vienna Waltz Orchestra and the Vienna Mozart Orchestra and became Principal Guest Conductor of the Dohnányi Symphony Orchestra Budapest. 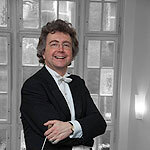 Bernhard Steiner has worked with more than twenty orchestras in Germany, among them the Bochum Symphony Orchestra, Hamburg Symphony, the Jena Philharmonic, the Cologne Radio Orchestra (WDR) and the Stuttgart Chamber Orchestra. In 2008 he made his debut with the Folkwang Chamber Orchestra Essen at the Rheingau Musik Festival. In Europe he conducted the Janáček-Philharmonic (Czech Republic), the Bilkent Symphony (Ankara, Turkey), the Orchestra of the State Opera House Odessa (Ukraine), the Philharmonic Orchestra Cluj (Rumania), the Radio Philharmonic Orchestra Ljubljana (Slovenia), the Radio Philharmonic Orchestra Kraków and the Silesian Chamber Orchestra (Poland). In Poland he maintained a permanent cooperation with the State Opera Houses of Bydgoszcz, Lodz and Kraków. Within the last seasons Bernhard Steiner has also established an impressive presence in the Netherlands and Belgium where he conducted Austrian operettas (“The Merry Widow” and “The Csárdásfürstin” in Amsterdam, Rotterdam and The Hague) and Italian Operas (“La Traviata” and “Lucia di Lammermoor” in Antwerp, Bruges and The Hague. In Bern (Switzerland) he made his debut with Mozart’s „Cosi fan tutte”. In China Bernhard Steiner appeared for the first time in 2010 working with the Radio Broadcasting Orchestra in Beijing followed by New Years – Concert tours with the Berliner Symphoniker in 2011, 2013 and 2015. In December 2015 Bernhard Steiner will appear with the Beethoven Orchestra Bonn for the first time. In March 2016 he will make his debut in the Berliner Philharmonie with the Berliner Symphoniker and with works by Haydn, Mozart and Beethoven. From 2006 to 2013 Bernhard Steiner was Artistic Director of the Mendelssohn-Festival in Koblenz and worked as a Principal Conductor at the Theater Hagen (Germany). In July 2011 he was announced Chief - Conductor of the Bayer Philharmonic Orchestra in Leverkusen. Furthermore, Bernhard Steiner was Assistant Professor for conducting at the Folkwang University for Music in Essen (Germany) for two years and is currently associate professor for opera at the University of Music and Performing Arts in Graz (Austria). There he will conduct Benjamin Britten’s „The Turn of the Screw” in June 2016.